The IMPACT Show is (and always has been) a way for us to connect on a deeper level with our biggest fans, to share an early look into what IMPACT is working on and learning, and to try out new things. IMPACT's mission is to help people and their organizations succeed. The purpose of the show was to take a stab at Facebook Live as well as to help more people succeed! In episode one, Bob shared some of the topics they planned to cover on the show including "building your team, getting buy-in from your organization, strategies and tactics that are working for IMPACT now, and more." Bob also shared how we know that growth leaders don't have a lot of time. "We're all busy and it can be hard to keep up. So at the beginning of each episode, Nick and I are going to share one thing that we're keeping our eye on - from Google algorithm changes to industry events or news." 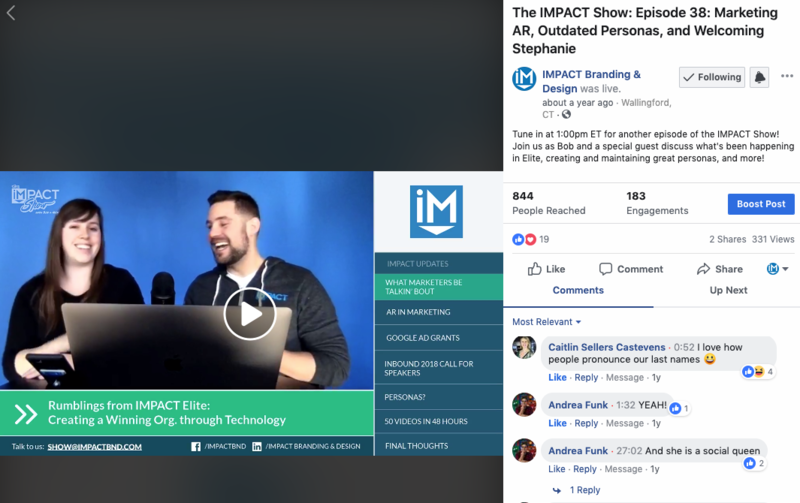 I didn't work at IMPACT yet but Iris Hearn, who was a junior inbound marketing consultant at IMPACT at the time, was active in the comments and engaging viewers in the discussion in real-time. 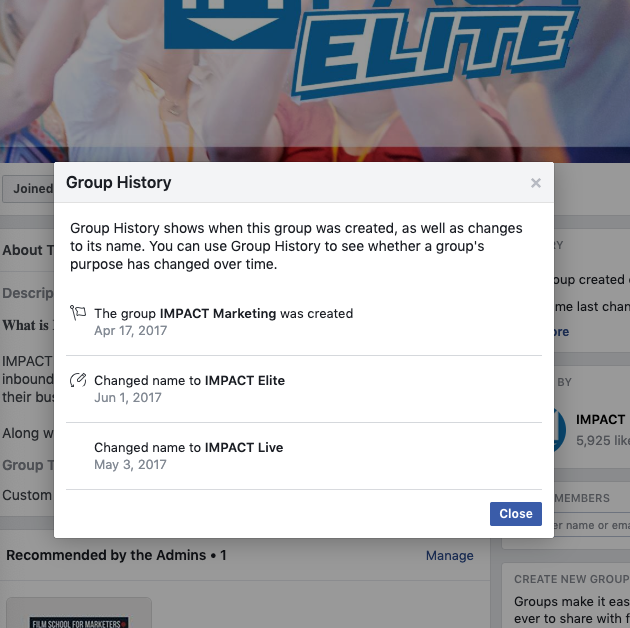 While the IMPACT Elite Facebook group was created around the time the show began, it didn't become IMPACT Elite until about two months later in June of 2017. The first episode was definitely a success. It has over 800 views and tons of comments and engagement. Episodes 1-20 were done live on Facebook. Episode 21 was streamed live from INBOUND 2017 and included special guests Marcus Sheridan, HubSpot's Kipp Bodnar, and DigitalMarketer's Ryan Deiss. The End of The IMPACT Show Experiment? Bob and Nick also discussed how they planned to do 24 episodes and see how it went and, since it was going well, they decided to keep going. They kept the new episodes coming every week all the way up to episode 37. Episode 38 of The IMPACT Show was different for a few reasons. First, this was the first episode I was on after I started at IMPACT! Second, this was the beginning of Nick's parental leave. From this point on, I hosted episodes with Bob Ruffolo, George B. Thomas, and Stacy Willis. While we didn't officially announce the beginning of "Season 2" of The IMPACT Show, on episode 43 we welcomed Nick back from the parental leave and Nick and I began consistently hosting the show together every week. Nick and I feel like this was the start of a new "season" of the show. We're now dubbing the 30 episodes from 43 through 73 as "Season 2" of the show. At IMPACT, we're always testing and trying new things. Episode 50 aired one year after the show began and it was already a very different show from where it started. Nick and I tried a number of new things through our first episodes together including adding a new intro segment, updating our equipment, and even changing the frequency of the show to every other week. No matter what we changed we kept the purpose and goals of the show in mind which was to engage with our audience on a deeper level and help more people succeed. On episode 58 we did a special live broadcast of the show from INBOUND 18 (#FreeDanSally) which was an absolute blast. However, we had been seeing engagement with the live episodes steadily declining for some time. So, on episode 59, we decided to stop doing the show live and start pre-recording episodes. This allowed us to add in more transitions and music, meant we didn't need Christine to run the back end production, we didn't have to worry about the constant technical issues with live streaming, and we had more flexibility with when recorded the show. From this point on we did pre-recorded episodes every other week until November of 2018. Once we had a smooth process in place for creating the more produced version of the show, including edits by our new team member Megan, we decided to try going back to doing the show every week. We quickly found that as the show had become more complex and the editing more time-consuming, we were not able to keep up with this frequency. We kicked off 2019 with episodes every other week and started including a guest in every episode (at the request of our viewers!). This brings us to Season 3 of The IMPACT Show which will begin next week on Wednesday, April 17th, 2019, which is also just one month away from the show's two year anniversary! Before we jump into what's coming in Season 3, let's take a look at what we learned so far. From surveying viewers of the show to analyzing metrics in Libsyn (our podcast hosting service) and on Facebook, we learned quite a bit about the show over the past nearly two years. We found that while people say they don't care how long the show is as long as it's good, shorter (less than 30 minutes) episodes consistently perform better. Episodes that featured a special guest or were streamed live from an event got an obvious spike in views because of the novelty but that did not translate to a consistent increase in viewers. We also found that the excitement around live video has decreased and people weren't making time (even on a Friday) to tune in to watch the show live. Finally, we learned that while people may enjoy the show, only 22% of the subscribers surveyed said they make it a point to watch every single episode. 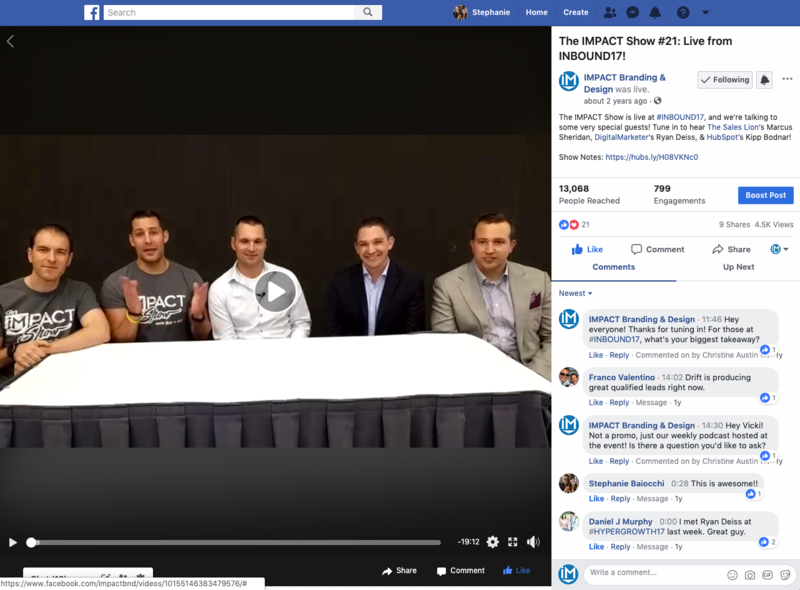 Our viewers said they enjoy getting an inside look at what IMPACT has learned and is working on as well as when we discuss new and important trends in sales and marketing. Our audience also wanted guests on the episodes which we brought in at the beginning of 2019 and we plan to keep and expand on this segment. Our show's audience also gave us some valuable feedback. They said they want to hear more about actual inbound campaigns, potentially from Elite members, with the results and lessons learned. We also know many viewers rely on the show as a part of their education and strategy development if they can't yet afford to invest in an agency like IMPACT for services. "We are a small company so we use all info from IMPACT as consulting for us and the changes we can make to get better. I think it is cool that you are helping small companies that can’t afford to hire you, for example with the IMPACT Show. We become loyal so if and when we grow and are big enough to hire help, we would automatically go to where we trust and know - IMPACT." That brings us to Season 3 of The IMPACT Show. We'll be kicking it off next week on April 17th, 2019, with a few big changes in place. 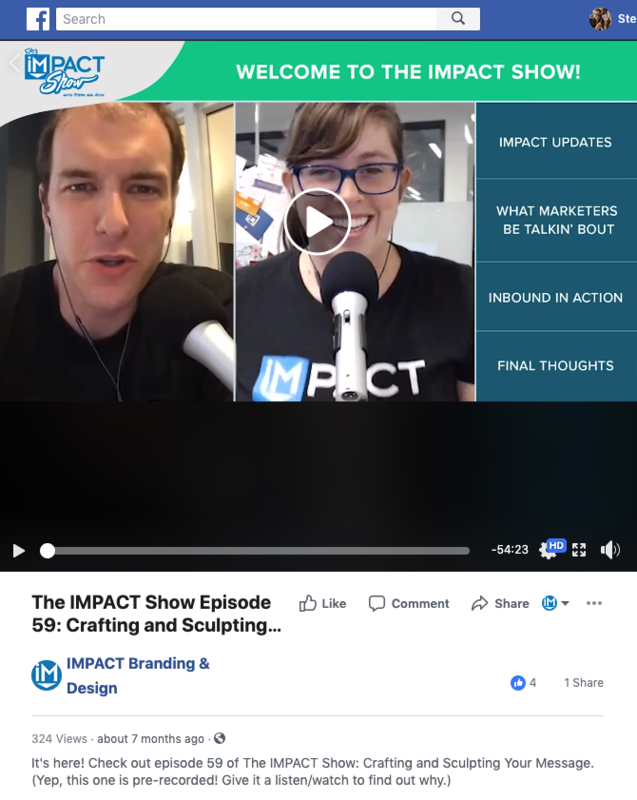 We had a few very frank discussions at IMPACT about whether or not we should keep doing the show and if we're keeping true to our goal of connecting more deeply with our community and helping more people succeed. We talked about what the show should look like if we keep doing it (we're still doing it!) and what needs to change. We shared data, asked for feedback from other podcasters and show hosts at IMPACT, and brainstormed ideas. I am very excited to share with you what we've come up with. The new episodes will be significantly shorter (think 10-15 minutes). We will still be doing a video podcast and sharing the audio to podcast platforms. However, we'll now only be publishing the video version in IMPACT Elite. We will be posting it on Wednesdays at 11:30am ET as a Watch Party which means Elite members can come watch the show together in real time. (Mark your calendars!) Nick and I will be hanging out in the comments and would love to chat with you all as you watch. We'll keep including guests but this section will expand from just IMPACT team members to including guests from the Elite community as well. We look forward to bringing you an improved and even more valuable show in Season 3 and as always, until then, we'll see you in Elite!